The raven had gotten himself into a very uncomfortable — and dangerous — situation. A plastic lid from a frozen drink had become lodged around his neck and mouth, and he couldn’t seem to get it off himself. 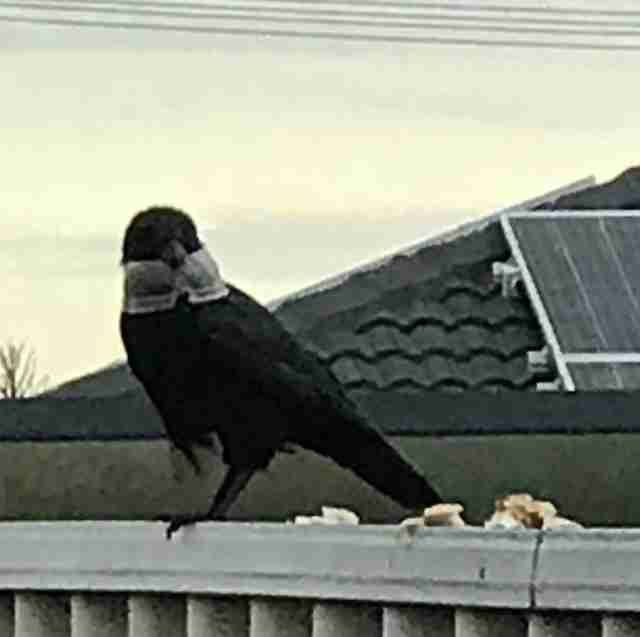 Luckily for the raven, a local woman, Dee Tsalis, spotted him in her neighborhood, flitting from roof to roof and tree to tree, and even hopping along the electricity and telephone wires along her street. Tsalis snapped a couple photos of the raven and posted them on a community Facebook page. 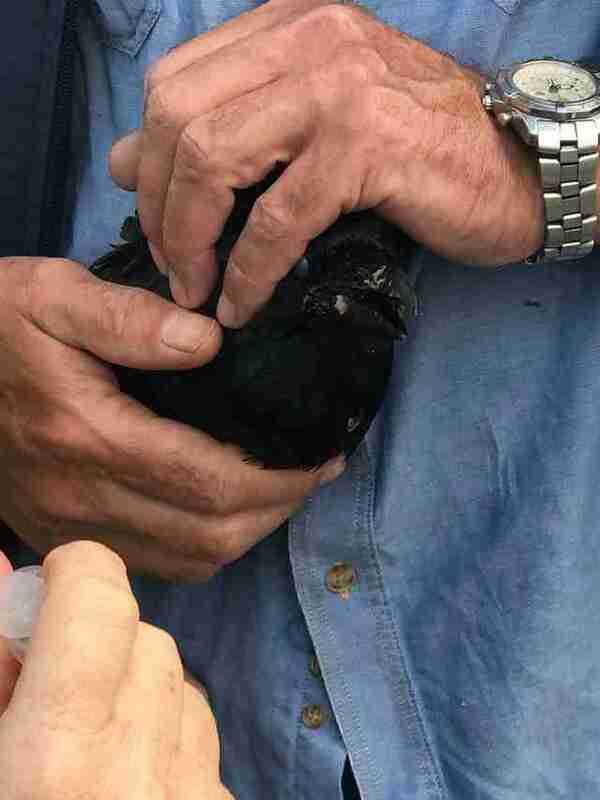 When Hickey and volunteers from Western Australia Seabird Rescue (WASR) saw the post, they rushed to Tsalis’ address to see if they could help. 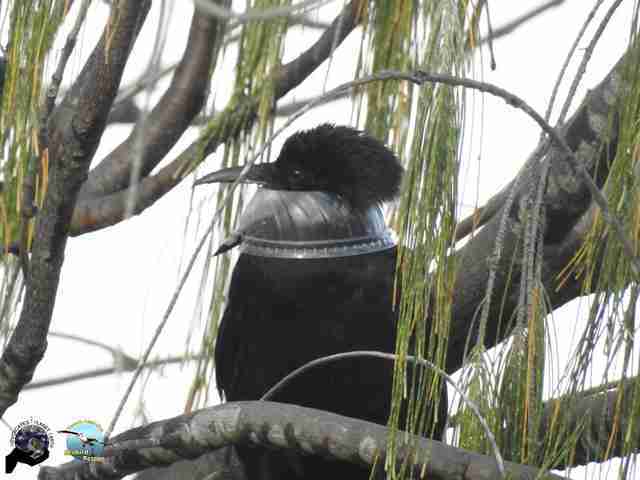 When they spotted the raven, he was still hopping around the area, trying to get the plastic lid off. 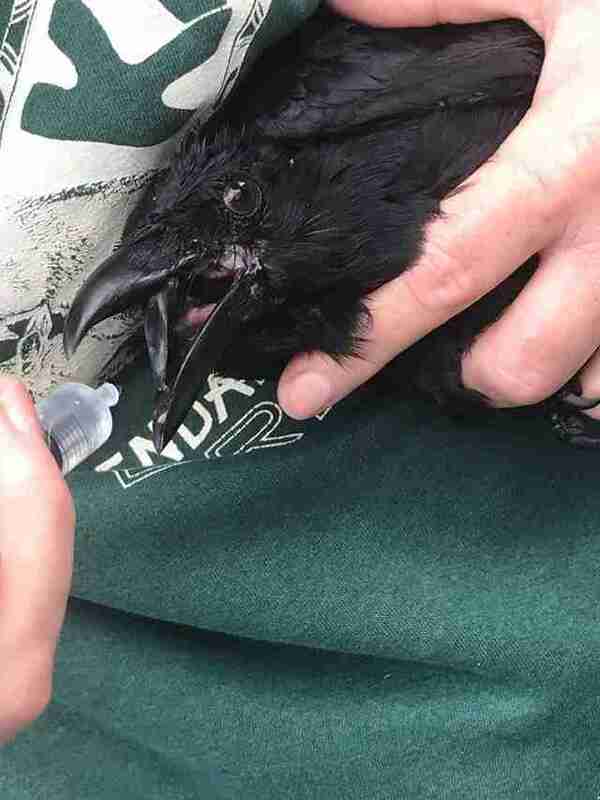 “Ravens can die from stress very quickly, so we knew the situation was very serious and we didn’t have much time to find a window where he could be saved,” Hickey added. 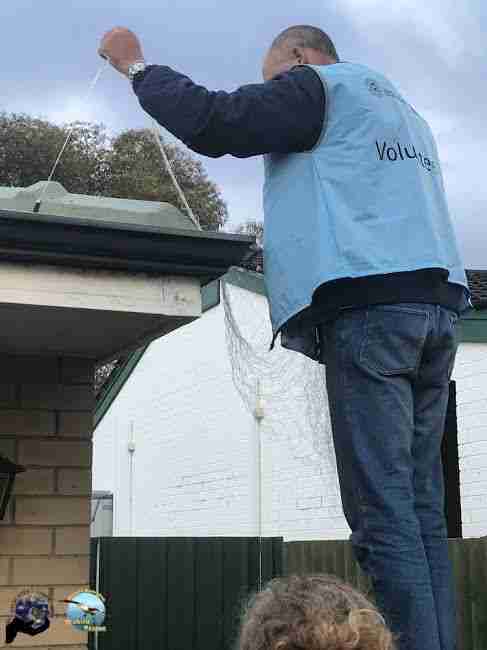 When the raven came to rest on a neighbor’s roof, Graeme King, a volunteer for Western Australia Seabird Rescue, used a net launcher to safely trap him. 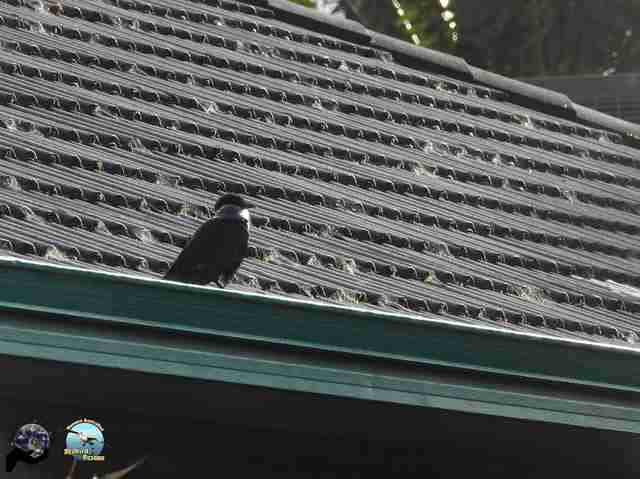 Then King climbed onto the roof himself to retrieve the injured bird. “At that moment, we all knew … he was safe,” Hickey said. 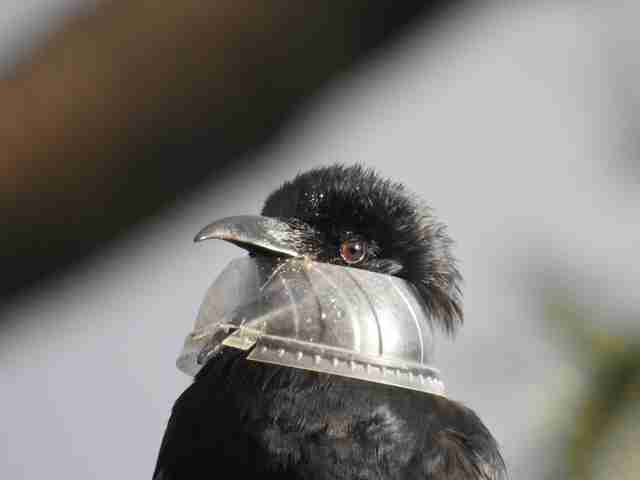 King and his wife Marlene used scissors to gently cut the plastic lid away from the crow’s beak and free the bird. 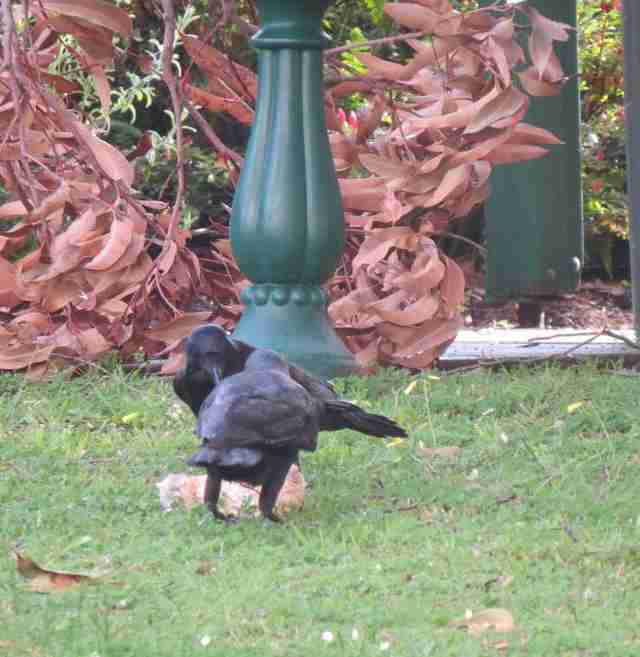 The rescuers gave the raven water and fortified meatballs. While they cared for him, they noticed another raven watching them closely from a tree. They guessed the raven was a relative — perhaps the raven’s mate or mother. 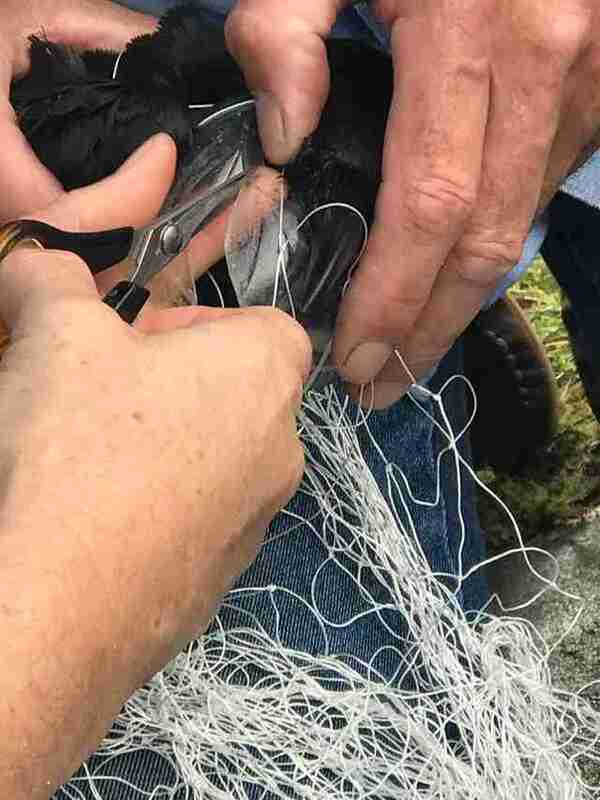 When the rescuers decided it was safe to release the raven, he flew to a nearby tree — and the other raven flew to the same tree to join him. At that point, they knew he would be OK. It is Hickey’s hope that the raven’s story will encourage people to avoid using single-use plastics, like plastic cups, straws, containers and bags, which wildlife can easily get tangled up or caught in — or even consume. “I don’t normally work with bird rescue, but this opportunity to work with Western Australia Seabird rescue was priceless, and a fantastic opportunity to show people why it is so, so important to say no to single-use,” Hickey said.